The boys got a care package from Grandma, as we couldn't be in St. Louis this year for St.Louis Cardinal baseball Opening Day 2011...she sent them REALLY cool shirts! Introducing our starting line up...Ryan and Mikey! 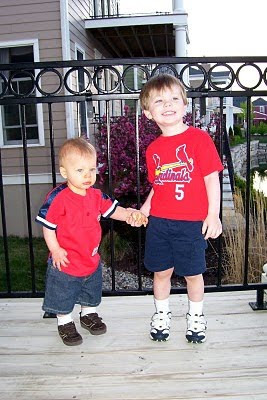 Proudly supporting...#7, Outfielder Matt Holliday, and #5, First baseman Albert Pujols! Amazing how much they have grown since last year! We will still cheer for you no matter where we live! We were pleasantly surprised, to get an invitation to our new friend, Miranda's 5th birthday party! We called and gladly said we would be there with Miranda, and meet a few new friends! Mikey, Mommy, and Ryan getting ready to leave. It was a princess party...but they had "monster" masks for the boys. Notice the crown...wonder if a kiss would change this monster, into a prince? Princess Miranda held "court," while opening her gifts! Yes...that is a full sized moon bounce house...INSIDE of their home! The kids loved it, as it was a very cold day outside! Ryan loved Bryce's work bench! 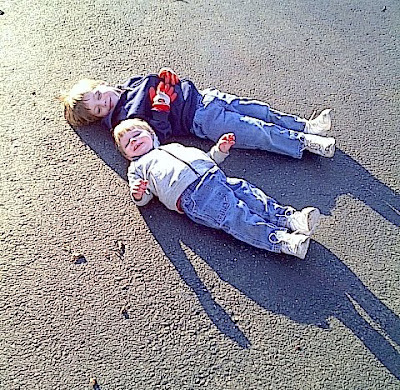 I found the boys laying in the sun, and laying on their backs. I asked why they were on the ground, and Mikey replied..."The sun is warm Mommy." We were invited for a neighborhood "Happy Hour," for Lynn's pre-birthday celebration. Everyone is supposed to be HAPPY during happy hour, right? While the adults had a few cocktails, the kids froze outside while playing on the swing set, and playing in the sand box. Mikey had to come inside once his lips turned blue, and it was time for PIZZA!! Kids enjoyed pepperoni, while the adults had crab pizza...can you say a slice of heaven? Add Old Bay seasoning, and it was amazing! It was a great time, and meet lots of great neighbors and their kids! Ryan Christopher Fortner is 2!!!! We had a very messy pizza party...nothing says fun, unless you cover your clothes in pizza sauce. Ryan looking at his cupcake tower! Ryan (& Mikey) opening his gifts! It was all about Disney*s Pixar CARS! A few new "CARS" joined our family...these two are just too cute! Ryan loved all of his cards, gifts, and phone calls! He had a great birthday! Thank you to everyone who made it SO special! The local volunteer fire department had its craft show, and train display... Mikey couldn't wait to go! Mikey looking all of the protective wear! The holiday fund raiser is a miniature electric train display. Everything from the display tables, to the buildings...even the guys who operate the numerous trains, time is all donated. Any funds raised go back to the volunteer fire department fund. Mikey and Ryan looking at the train display. Dean showing Ryan how the buttons work. The boys loved the fire house! Dean and Mary surprised the boys with gardening tools! Mikey and Ryan, with their gloves, rake, and garden spade. The many seeds, that must be planted. Mikey, Mary, and Ryan reading the packets to see if they can be planted. Mary showed the boys how to place one seed, in each little dirt filled starter pot. Mikey loved planting with Mary! I used a template I found on the Internet to make the cupcake liners, and used wavy cutting scissors to finish the edges ...way too easy to make! Mikey wanted to be my be my big helper, and he stuck ALL of the stickers on! He of course needed a few...on each hand! The FedEx man delivered a fun surprise for Ryan! A really sweet little birthday bear, from Build a Bear, that has a party hat, bow tie, sash, card and cupcake! The cupcake sings a birthday song, and Ryan loves it...he giggles, and then starts dancing! Thank you Grandma and Papa Lee, for sending your love all the way from St. Louis! 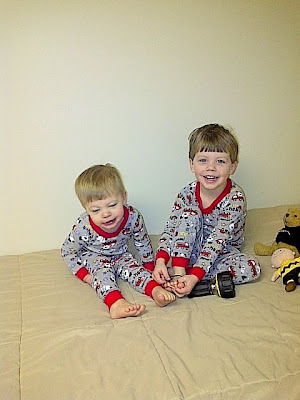 This is how I found Ryan and Mikey this morning...giggling and sitting on Mikey's bed! After breakfast I found them playing in Mary's foot rests, near the couch. 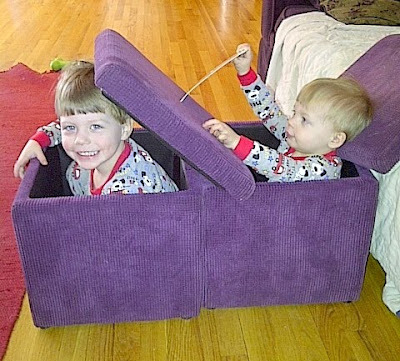 The lid lifts off, and both boys think they can hide in them.